Are you ready to rrrrrrrocccccck?! Good, because Leander Games, the makers of innovative slots like the fantasy-inspired Dragon Slot and poker-themed game, Castaway, has turned their attentions to music – in this case, the 80s/90s thrash metal of American legends, Megadeth. The titular slot is a 5 reel, 40 pay-line slot with a max jackpot of $5,000, and for fans of the band, perfect for a night of headbanging slots moshing. In fact, if you’ve played Microgaming’s reality TV tie-in, The Osbournes, based on the show about the legendary Black Sabbath front man, Ozzy Osbourne and his family, this game will be pretty familiar. The members of Megadeth appear as icons, along with their respective instruments – which include bass guitars, electric guitars, drums and also picks and amps. Winning combos involving band members will then give way to short video sequences featuring the band in action on stage. Dave Mustaine is Wild... Unsurprisingly! Lead singer Dave Mustaine acts as the game’s (very wild) Wild, substituting for all symbols other than the Scatter. Dave and his flowing blonde locks will expand across the reels as well when they hit to turn it all up to 11 and give you an intravenous shot of ROCCCCKKK. There's a Mega Nudge Feature! As with some other Leander slots, there’s a special Nudge feature – here called the ‘Mega Nudge’ – which allows players to nudge reels 2 and 4 up or down in order to make better winning combos. You have to pay for this privilege, of course, so it can really add up when deciding how much to bet. 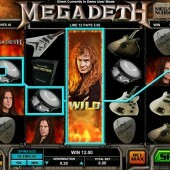 Hit Vic Rattlehead (Not Literally) to Spin the Mega Wheel and Win Prizes! Three bonus Vic Rattlehead symbols landing on reels 1, 3 and 5 launches the bonus round. You get to spin the Mega Wheel first to see which bonus game you get, or an instant cash prize. 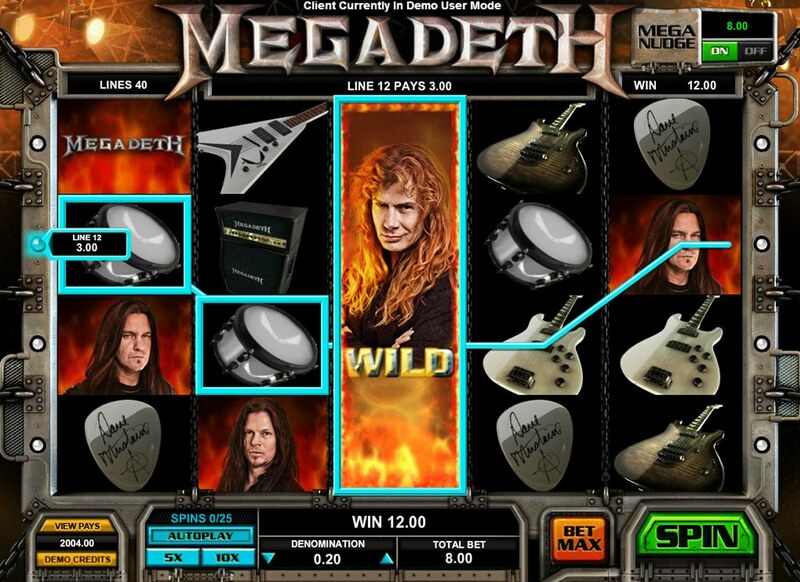 The ‘Hangar 18’ round is a straight free spins bonus where 5 to 15 spins are awarded, but a Sticky Wild Mustaine (which sounds like one of the frontman’s legendary parties in the 80s) features throughout the spins, making this a great little feature to hit. The Headcrusher Bonus, meanwhile, recreates one of the band’s famous music videos. A straightforward Pick Em Bonus, you have to pick from a selection of male and female prisoners in order to win bonus amounts. Try and avoid the male prisoners, as they will see your prize amount diminish.